After a distress call is sent out throughout the city, the lovely Super Nikki shows up to rescue the trapped citizen…only to run into her sister (and rival)…Super Velvets. The two argue over who gets to save the day, leading to an epic super battle that includes invisible punchouts, super-speed fisticuffs, multiple KOs, special FX, and more…leading to one hell of a back and forth display of heroic sibling rivalry! A final display of powers ends this battle, featuring a stunning electrical blast to the temples that leads to an over the top KO and a sudden banshee scream that leaves one lady stunned. The sisters, exhausted, deliver a final DOUBLE coupe de grace via a massive POWER BLAST! 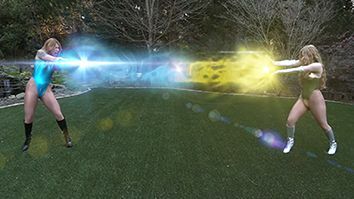 The ladies charge up and shoot dual beams that collide, both putting every last drop of their power into the blast until the kinetic energy causes a massive explosion that knocks BOTH heroines out cold! We then see a stranger enter the scene (via POV), inspecting the sleeping sisters while revealing a final twist: the distress call was simply a ploy for him to trap two of the top heroines in the city!!! We fade to black as both super-babes enjoy a blissful nap, unaware of evils to come!